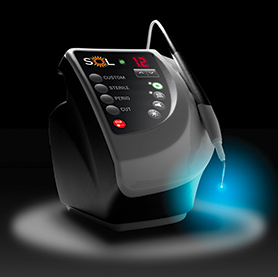 A diode laser can be used to assist in killing bacteria and stimulating cell growth in the gum tissue, and to help regenerate healthy tissue. One of the biggest advantages of lasers is that they actually seal the nerve endings and blood vessels that can cause pain, so discomfort is very minimal, and often non-existent. Dr. Munar utilizes diode lasers for all procedures that would have previously required invasive electrosurgery or the use of a scalpel and stitches. The laser works by emitting electrons that generate heat and it is the heat that actually does the removing. Lasers are much kinder to the tissue and the final result is much more predictable.